Do you want it fast, good or cheap? Can you expect to have all 3 at the same time? – Gould Design, Inc.
Do you want it fast, good or cheap? Can you expect to have all 3 at the same time? Do you want it fast, good or cheap? Can you expect to have all 3 at the same time? The customer is always right, that’s what we have always been told. While this is truth in its purest form, we will need to live in reality. The customer always wants the cheapest price, with the highest quality, as fast as they can get it. This is kind of like going to a Mercedes dealership looking to pay for a Ford. Or maybe going to a fast food restaurant looking for health food. Better yet, expecting a package to be sent overnight mail at the cost of a single postage stamp. Reality is, 2 of the 3 are possible. Do your salespeople know this? Are they over-promising? The worst thing a sales person can do is over-promise and under-deliver. The best thing a salesperson can do is under-promise and over-deliver. Credibility is either lost or gained based on the “promise”. 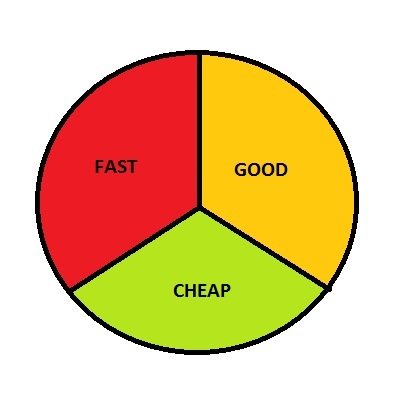 If the customer wants the product/service fast and good, it cannot be cheap. Quality and speed cost a little more and require more effort. If the customer wants the product/service fast and cheap, it cannot be good. When we compromise price and deliver quicker, the quality drops. If the customer wants the product/service cheap and good, it cannot be fast. When we want quality and affordability, speed is not possible. Are your sales people over promising or over delivering? The answer to this simple question could explain your company growth (or lack thereof). The only way to really find out the truth to this question is to ask your customers. How is your communication with your customers? This is a great article, and holds true to all service industries. I kept a sign – much like the graphic you have – in my office that simply said “Pick two.” Initially, I was concerned about what clients would say, but then again, the ones that wanted all three weren’t companies I wanted to deal with. Truly the trick is to sell all three but with a twist. Do not sell speed, quality and price. Sell quality, schedule (that meets their real needs) and value. Value is different than price and must be sold as such. When selling value, basically we are selling them money. In that way, we sell them on how what we are going to do helps them to meet their schedule and financial goals in a way that takes the worry out of it for them. By showing them how the value of what we do can save them money, either in expenditures or in schedule to completion of their project, we can serve the same need as being a low budget option. Admittedly, some clients well expect that we do all this and give it to them for nearly free any. The question then becomes, do we really want to work them? Agreed! It’s nice to see that I am not the only one who recognizes the meaning of value!